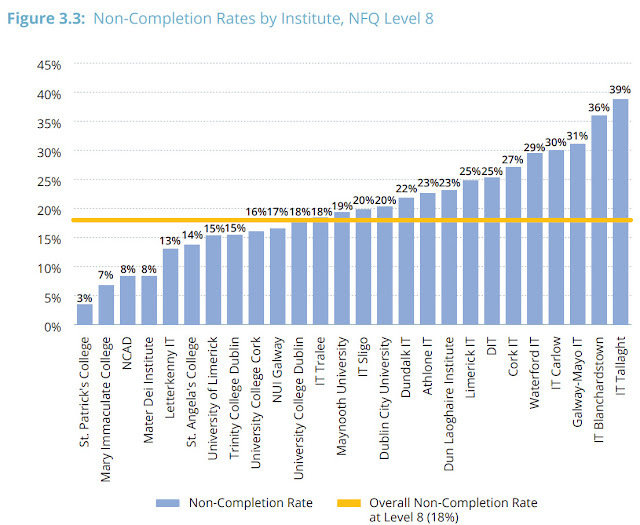 The HEA have produced a major study on An Analysis of Completion in Irish Higher Education: 2007/08 Entrants, which makes for interesting reading. 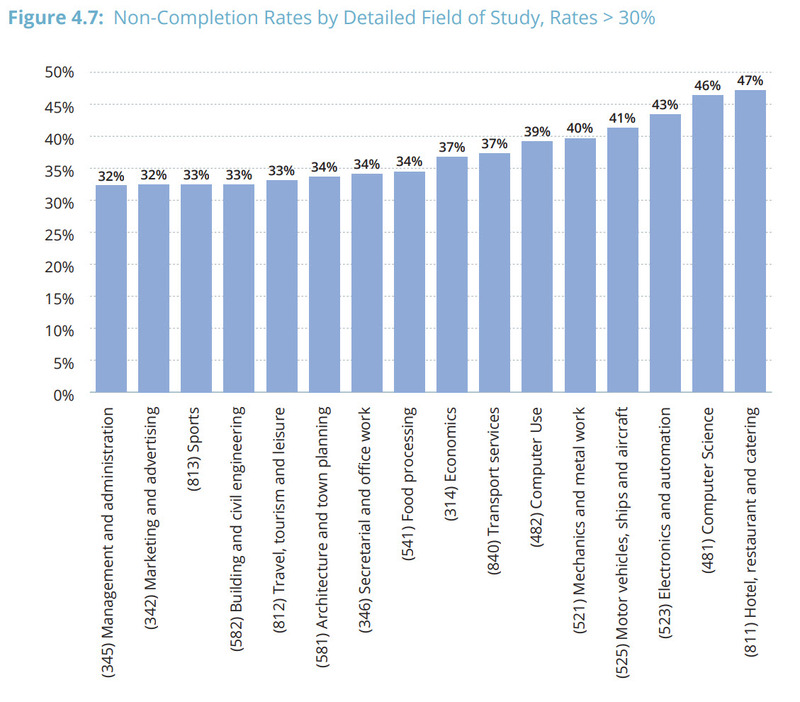 As with many HEA reports there is a lot of detail and mountains of data (this report is 220 pages long!). It does not include the National College of Ireland nor the likes of the Dublin Business School which is a big pity and a major omission in my view. Out of this report, Katherine Donnelly of the Irish Independent headlines her report today with "Tech courses are toughest to finish in college". While this may be true, the report digs a lot deeper than a one-liner in the paper. The report divides up the HEA sector into three categories: Colleges (not including NCI), Institutes of Technology, and Universities. Data on levels 6 and 7 for Colleges and Universities is not included - presumably because they don't offer courses under level 8 (honours degree level). Technical courses are indeed challenging, and the HEA point to the Mathematics component of Computing courses as a possible reason for non-completion. The image of working in IT of creating best-selling games, killer apps, and making a lot of money with the potential of becoming a multi-millionaire is a strong one, but this is not going to happen until you learn some Maths and Programming. The HEA report also suggests a strong link between CAO points and non-completion rates - perhaps we are letting some students on low points onto courses they are not yet able for. I do see lower numbers of students finishing courses than the number at the start in my own classes - it is inevitable. Choosing the right course is a two-way thing: we have to make sure that the course is right for a student, but we also have to make sure that the student is right for the course. I really don't see how an 18 year-old school leaver can be certain of what their future is going to bring - in 1977 when I was 18, I certainly didn't. Most Colleges have tried lots of things to engage first year students in an effort to keep them on board and reduce non-completion. Based ion the HEA figures we all have to try harder!